Jacqueline Robinson, who did Aretha Franklin's hair, said the singer was "very, very inspirational... as an African-American woman"
For years, Jacqueline Robinson was a hairdresser to Aretha Franklin, invited to lavish Christmas parties, whisked off to meet Oprah Winfrey or joining the likes of Stevie Wonder at dinner. "I had a headache. I had a stomachache. I cried all day," Robinson told AFP, finding comfort by listening to radio stations that honored the "Queen of Soul" by playing Aretha songs until midnight. It was the late 1990s when the music icon telephoned for the first time, asking Jacqueline to style her hair. When her limousine pulled out front, people from neighboring businesses stopped to stare. But the 18-times Grammy winner, hailed the greatest singer of all time by Rolling Stone magazine, was never one for airs and graces, taking her seat in the salon alongside any other customer. "She would lay back in the shampoo bowl just like everybody else," Robinson said Friday, perched on her hairdresser's stool, grey hair swept back, lipstick perfectly applied and elegantly dressed in black. "She never tried to project herself as 'being Aretha' or 'get out of my way.' Never, never, never." 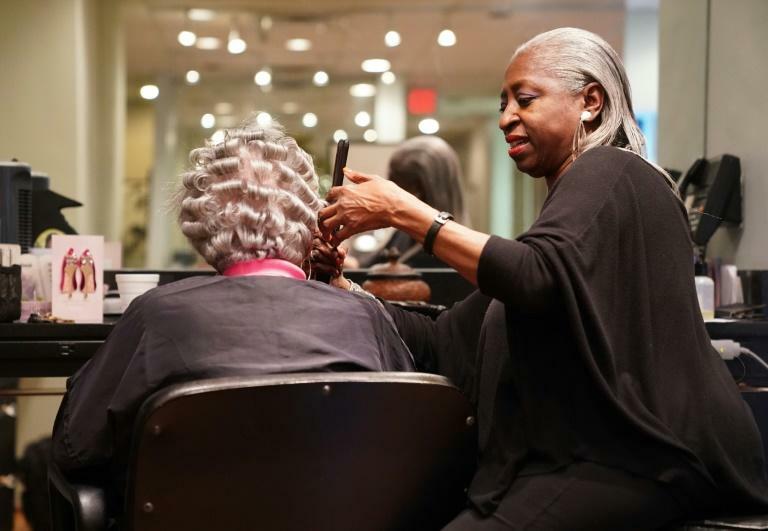 The soul legend had several, if not many hairdressers in Michigan, but Robinson was the one she chose to style her hair for appearances on the Oprah Winfrey Show and the BET Awards. "I would hear her singing in the bathroom when I was traveling with her," she recalled. "You never heard somebody singing and it sounds like a full orchestra behind them? That's Aretha. Beautiful voice." "She loved it when I did her hair," Robinson said. "She said 'Jacqueline you're very special, you have a wonderful touch.'" Robinson's brain is packed with indelible memories, such as chatting backstage with Winfrey and Mary J Blige, or not a dry eye in the house after Aretha's performance of "Amazing Grace." "I mean, there were so many tears, so many tears. She's so wonderful. Oprah was crying. It was great." There were also moments of hilarity. For the BET Awards, Aretha asked her to style her tresses into a chignon, which the performer planned to reveal as a "wow factor" on stage by suddenly whipping off a wig. Except, when she did, the wig sent flying a priceless earring on loan from a jeweler in New York for the telecast. As producers frantically cut to a commercial break, Robinson joined everyone else on their hands and knees until the earring was found. Music legend Stevie Wonder and R&B singer Alicia Keys were at those awards, she remembers. "When it was over I got to eat dinner with all these people... It was wonderful." It wasn't just hair. Aretha stopped by the same salon for $80 mani-pedis with manicurist Shawn Frazier for 10 to 15 years. Rust orange, silver and a blue-silver were her favorite colors, Frazier recalled. "People were so amazed that she would just come in and just be normal. Her security would sit up front, and her driver, but she would walk around,"Frazier said. "She just made you feel comfortable." Frazier bubbled over with memories of the lavish Christmas parties that Aretha would host, one set in a winter wonderland made to look like snow, with music, food and invitations by special delivery. Franklin's signature song, "Respect," was her calling card, a feminist anthem and one that inspired generations of women all over the world. To Robinson, she was also "very, very inspirational... as an African American woman." After training in Europe, Robinson was in the 1970s the first black hairdresser to work at a fancy white salon. For a year, she was an assistant, then forced to work in a back room. Two hairdressers threatened to quit if she was hired, so each morning she would get them coffee and clean out their ashtrays, before finally being promoted properly, eventually leaving to set up her own business. "Miss Franklin was very, very, very encouraging," she told AFP. 'Don't be afraid, there are enough women who are going to support you," she remembered Aretha saying. "She gave us all pride," Robinson concluded. "Aretha was always Aretha, always high, always singing 'I love Detroit.' Always, she said that. So she was inspirational for all of us."